Since the drive to Mathis is about an hour, Adam and I get on the road around 9 am. After a couple of tacos and coffee at La Tapatia we are on our way to Mathis. We arrive around 10 am to windy conditions with the sun high. 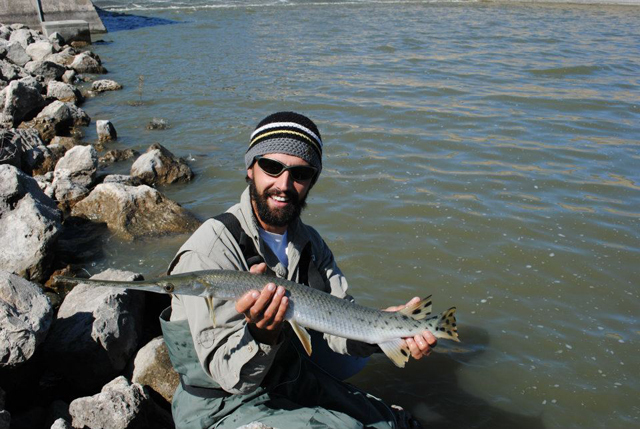 When we get down to the river we instantly see gar rolling. After dozens of casts and a few missed fish, I start getting frustrated and decide to put the rod down. Adam brought his new DSLR, and I decided to play with it. While I was toying with Adam’s camera, he hooked up on a longnose. After a few more casts and more missed fish, I get hung up on a rock under water. Some days anglers just don’t have it, and this day was not mine. I tried to roll cast the fly out but it didn’t look like it was going to happen. As I lifted my rod to try to get the fly out again, my rod broke. I break a lot of rods and with the amount of pressure I applied it shouldn’t have broke. I was pissed. I was so angry I threw my rod in in the air, and as my rod came down I heard the sound of metal on rock. I walked back to the rod and started to pick up the line I had out, and with every rotation of the spool I could hear a grinding noise. I bent the frame of the spool and it rubs the reel. Just goes to show don’t throw a fit because the fishing isn’t going your way or because you break a rod, you might break other gear. 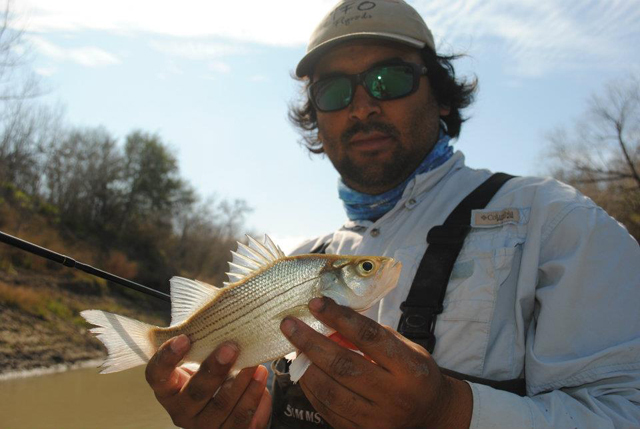 A few weeks later Adam and I hear word of white bass running further up the Nueces and decide to try or luck. This drive is slightly worse than Mathis, and is all the way at HWY 59. 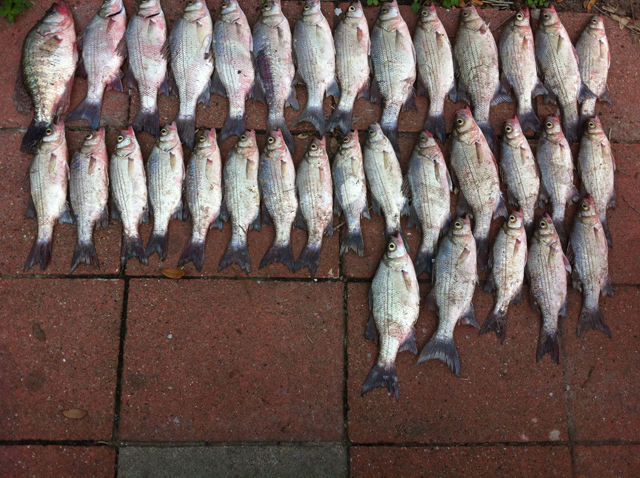 Having grown up near freshwater my whole life I am not sure why I never targeted white bass before. We got to the river early and made our way down stream. At first, the fishing looked like we might not catch anything. As I was walked along the river, the mud was really thick, and I was a little nervous to get into the water. After seeing fish wake in a pool across the river, I decided to give it a shot and step into the river. After my first few steps, I realized that the water was much shallower than I had thought, and the ground was firm. I made my first cast into the pool that was holding fish and started picking up fish. After about an hour of catching of small fish, we decided to move down river in hopes for something bigger. I would say we waded about a mile down the river and found fish every inch of the way down. The bigger fish were generally near structure. 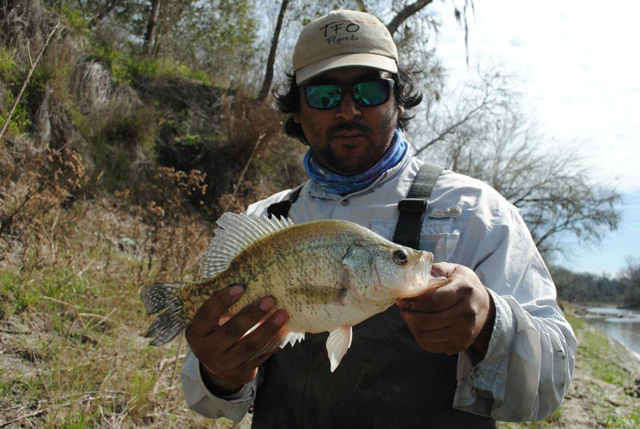 There was also a few spots along the way that you would catch mostly crappie. At one of the spots I hooked into a pig of a crappie. This trip I caught my first white bass and crappie on any tackle. Trip totals were over 200 fish a piece, we brought home 33 whites and 1 crappie.